Giving online is now available thru the Cornerstone Online Community. As of January 1st, 2013 Cornerstone Church has changed online giving providers. As a donor this effects you in a couple different way. First, all giving will be done directly through the Cornerstone Online Community. (COC) Please login to you account here. If you do not have an account or need your password reset you can do that here. Secondly, if you have given online in the past via the our website you will also need to log into your account and set up that giving again. lastly, the benefits of our new system awesome. 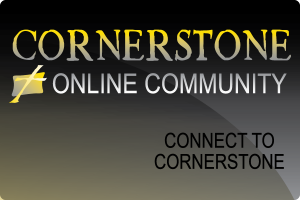 Benefits of Cornerstone Online Community Giving. Ability to set up recurring online giving. Ability to give to specific accounts…general, missions, speed the light, etc. Ability to register online for events, youth retreats and summer camps. Ability to review and print your giving statements any time within the Cornerstone Online Community. By giving online you can view and print year to date giving statements anytime. Also register and pay for events all online. Thank you for your support of Mission Global.